Onekama School has one team competing in this year's regional tournament in the Primary Division. This kindergarten team, coached by Connie Scheppelmann and Jennifer Bromley, performed their skit in room #340 at 1:15 p.m. 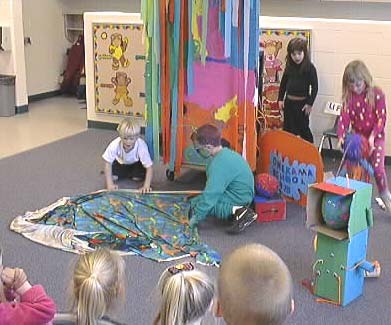 The 1998 Primary Problem was to create and perform a skit about a Dream Vacation which must include two sights and an experience at each sight. 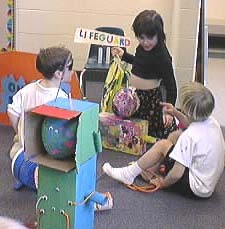 The performers had to include a main character and a team-created song. Over 100 teams compete at our regionals. The Long-term presentations ran from 7:30 a.m. until 4:30 p.m. and were followed by an Awards Ceremony. 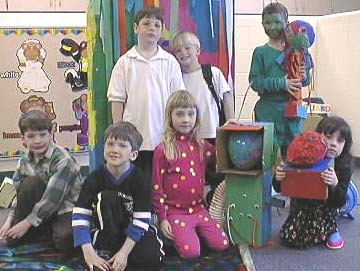 Team members are Cody B., Danny., Kailani B., Joseph F.,, Anja G., Gus L., and Jonathan N.
The team made all their props. They did their own set up, and wrote their whole script. After their performance they answered questions posed by the audience.